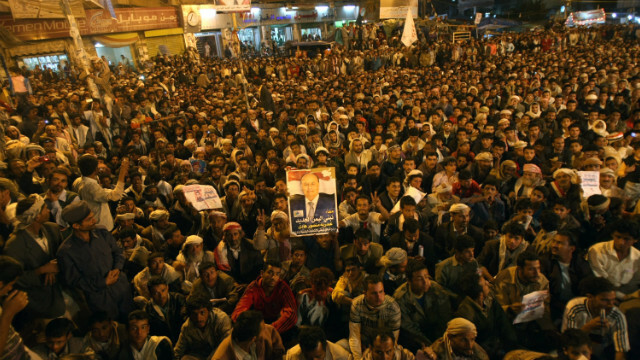 Yemeni anti-government protesters celebrate the end of the regime of President Ali Abdullah Saleh in Sanaa, February 22, 2012. (CNN) -- Yemen will swear in its new president Saturday, cementing a power transfer deal reached in November to end months of protests and violence over outgoing leader Ali Abdullah Saleh's longtime rule. Abdurabu Mansur Hadi -- who served as Saleh's vice president and then became acting president in November in an agreement brokered by the Gulf Cooperation Council -- is expected to be sworn in Saturday in front of Yemen's parliament. On Monday, a formal inauguration will take place in Sanaa -- one that Saleh is expected to attend. A spokesman for the country's embassy in Washington said late Friday that the president has returned home, after a short U.S. visit for medical treatment. "As of Saturday morning, Hadi will be Yemen's president and the inauguration on Monday will only be ceremonial and a celebration in support for Yemen's new leader," said Abdul Aziz Jubari, a member of Yemen's parliament from Saleh's General People's Congress party. Hadi received 99.8% of the 6.6 million votes cast in Tuesday's election, according to Mohmmad Hassan al-Hakimi, chairman of the Supreme Committee for Elections and Referendum. Saleh was wounded in a June assassination attempt at his presidential palace during battles between government troops and tribal fighters. A "massive celebration" was being planned for Saleh, who will not necessarily disappear from Yemeni politics, said Abdu Ganadi, a senior Saleh aide. "Saleh has the option to continue involvement in politics and the power transfer deal will not force him to step aside," Ganadi said. "He is the leader of the GPC and his voice and support will continue being heard in the GPC." U.S. Secretary of State Hillary Clinton called the Yemeni election "another important step forward in their democratic transition process." Human Rights Watch has called on Hadi to make changes without delay. "Yemen's potentially historic transition will be off to a shaky start unless Hadi makes an immediate break with the abuses of the past," said Letta Tayler, HRW's Yemen researcher. "Yemen's new leader needs to move decisively to usher in promised reforms that uphold human rights and the rule of law." The 65-year-old Hadi is a British-, Egyptian- and Soviet-trained army officer, recently promoted to field marshal. He had been vice president since 1994 and ran for a two-year term as president on pledges of improving security and creating jobs. But he's never had much of a power base, and Yemen's problems are expected to take longer than two years to fix. Yemen is the poorest country in the Middle East, with a severe shortage of water and rising levels of malnutrition among its population of about 25 million. Saleh faced a separatist movement in the south, sectarian tensions in the north and the growing presence of what Western officials describe as al Qaeda's most dangerous affiliate, al Qaeda in the Arabian Peninsula. 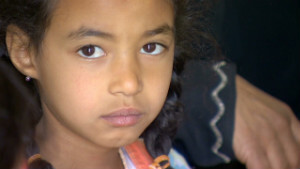 CNN's Mohammed Jamjoom, Jamie Crawford and Kindah Shair contributed to this report. Advocates say the exam includes unnecessarily invasive and irrelevant procedures -- like a so-called "two finger" test. Supplies of food, clothing and fuel are running short in Damascus and people are going hungry as the civil war drags on. The face that launched 1,000 myths? Supporters of Richard III want a reconstruction of his head to bring a human aspect to a leader portrayed as a murderous villain. Robert Fowler spent 130 days held hostage by the same al Qaeda group that was behind the Algeria massacre. He shares his experience. As "We are the World" plays, a video shows what looks like a nuclear attack on the U.S. Jim Clancy reports on a bizarre video from North Korea. The relationship is, once again, cold enough to make Obama's much-trumpeted "reset" in Russian-U.S. relations seem thoroughly off the rails. Iraq war: What was your experience? Ten years on, what do you think the Iraq war has changed in you, and in your country? Send us your thoughts and experiences. Musician Daniela Mercury has sold more than 12 million albums worldwide over a career span of nearly 30 years. Photojournalist Alison Wright travelled the world to capture its many faces in her latest book, "Face to Face: Portraits of the Human Spirit." Europol claims 380 soccer matches, including top level ones, were fixed - as the scandal widens, CNN's Dan Rivers looks at how it's done. That galaxy far, far away is apparently bigger than first thought. The "Star Wars" franchise will get two spinoff movies, Disney announced. It's an essential part of any trip, an activity we all take part in. Yet almost none of us are any good at it. Souvenir buying is too often an obligatory slog.